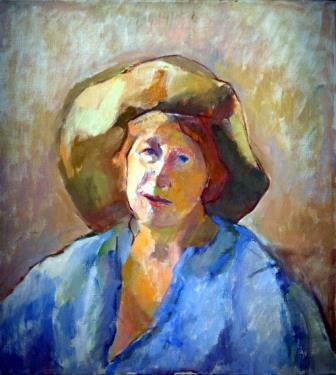 This portrait is of a foundation member of Theatre West Van, Edith Powell. It was painted by her daughter and generously donated to us by her son in law. "The whole thing started in 1945 when a Mrs Edith Powell of Keith Road put an ad in the local paper to try to spark interest in forming a local Little Theatre. The ad was answered by Mrs Dorothy Sherwood and Mr and Mrs Ernest Lows. Soon others joined them. An executive was formed at a meeting in March 1946 with about 20 members. The first play was presented in October 1946 - Distinguished Gathering by James Parish - and Mrs Sherwood and Mrs Powell both acted in it." Edith Powell was described in a program as "one of our most accomplished character actresses and comediennes. She has also appeared professionally on stage and TV and sings with the North Vancouver Operatic Society." We are happy to have Mrs Powell once again grace the stage of Theatre West Van.